Triptych. Tempera and gilding on panels. Central panel with carved and gilded border and applied repousse haloes. Height: 8.5 in approx., Width: 11 in approx. This triptych was donated to the museum by Colonel D H Colnaghi in 1924. While Colnaghi seemed to be more interested in his large collection of coins and stamps than in works of art, this icon was also in his collection in 1924. Colonel Dominic Henry Colnaghi, of the Royal Engineers, was related to the long established British firm of Colnaghi's, dealers in fine prints. He was the son of Sir Dominic Ellis Colnaghi, who was the once the British vice-consul at Missolonghi, and who also travelled extensively through the Holy Land. There is a good chance that the icon was a family piece. 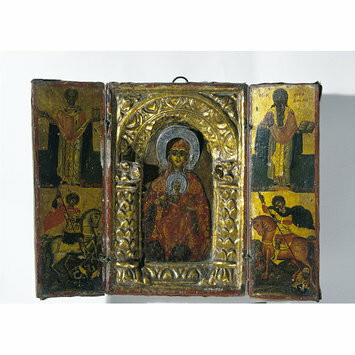 Historical significance: The triptych is of conventional Byzantine arrangement, with a main image of the Virgin and Child enclosed by two wings, which depict saints. 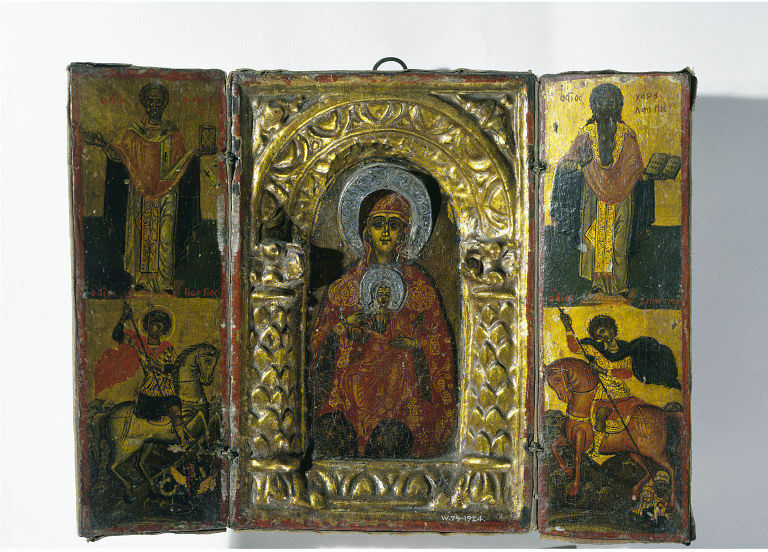 The carved wood frame which surrounds the Theotokos (or God bearing one, the Virgin) is characteristic of the type of frame employed by Greek artists in the sixteenth, seventeenth and eighteenth centuries at a time when more costly materials and metals were not widely available. Metal, silver coloured nimbi (or haloes) which retain traces of blue pigment have been added to the figures of the Virgin and Child, but may not be an original feature. The iconography of the Virgin and Child appear to be of the Hodegetria type, but Christ is positioned more centrally in this icon than is normally seen. The Virgin wears a blue under dress which is spangled with gold stars, and a red maphorion (or cloak) covered with chrysography (or gilded decoration). The finely delineated chrysography displayed on the garment worn by the Christ child, however, is of a slightly different colour and is rubbed. It seems likely that the gold on the maphorion of the Virgin was added at a later time, a supposition supported by the sloppy re-gilding visible around the greenish-brown ground above the head of the Virgin. An inscription is visible near the head of the virgin but it is not clear. The facial features of both the Virgin and Child recall the style of the thirteenth century, but have been heavily overpainted. The saints depicted on the wings of the triptych also appear to have been heavily renovated. The gold grounds of all the figures have been renewed, resulting in a garish brightness, and a fine, black, linear decoration has been added to the gold in order to add detail. While Saints Nicholas and Charalambos still seem to maintain a portion of their original chrysography and detail, the figures of the warrior Saints George and Demetrius appear to have been far more over painted, perhaps due to the addition of old not only to the grounds behind them, but also to other portions of their costume. Based on style, the wings may have been substantially renovated. This is difficult to ascertain, but the overall state of this triptych may well indicate a substantially older paint layer beneath. The doors and reverse of the triptych are covered in fabric, which would also indicate a refurbishment. An older paint layer may also be visible under this fabric. This icon is included in a hard-bound, typed manuscript [copy from the "Department of Paintings", now located in Paintings section library, Word and Image Department]: List of Icons in the Victoria & Albert Museum with a List of Books and Articles on Icons Classified According to Languages (see List of Contents). 1931. 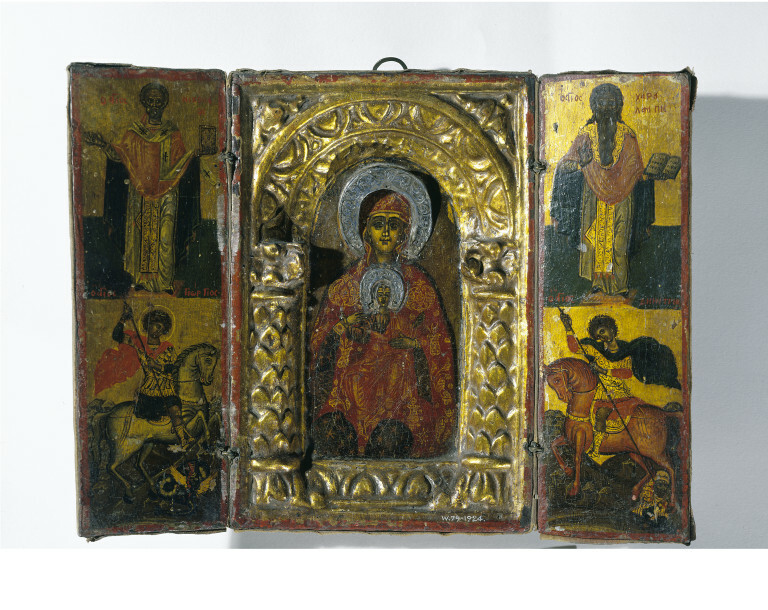 Subject: Triptych: wood, painted with The Virgin and child; St. Nicholas; St. George killing the Dragon; a bearded saint holding a book; and St. George killing a paynim (?) [paynim means a non-Christian] (St. Demetrius).